Who Deserves a Fare Subsidy? Updated: Further information on the history of seniors’ fares has been added at the end of this article. With the never ending problems of balancing the TTC’s budget, the question of trimming or eliminating various forms of fare subsidy are back on the table. This shows up as a quick fix to revenue problems with the assumption that “if only riders paid more, there wouldn’t be a problem”. The target group varies from time to time, but the premise is the same – somebody is freeloading and “my tax dollars/fares” should not be paying their freight. A basic problem with this argument is that it will not fix the revenue shortfall permanently, only increase the cost of using transit by whichever group is targeted. If, for example, all discount fares were eliminated in 2017, we would be right back at the same position in 2018 wondering how to deal with increased costs, but without that convenient list of scapegoats. A quick review of the “concession fares” is in order to put the question in context. Adults who are willing to purchase tokens up front (or preload their Presto cards) get a discount relative to riders who pay cash. Adults who want to prepay even more can purchase daily, weekly or monthly passes which cap their costs within a time period. Special passes and validation stickers are available to extend the range of services covered by adult passes to premium fare routes and to other transit systems. Daily pass holders get a special “family” deal on weekends and holidays when up to six people, maximum two adults, can travel on the pass. Monthly pass holders can obtain various extra discounts based on a commitment to buying 12 months’ worth of transit (the Metropass Discount Plan or MDP), and bulk-buy discounts are available to organizations that resell passes (the Volume Incentive Program or VIP). A Convention Pass is available to allow for bulk purchase of transit service for large groups at a price considerably below the cost of a day pass. Students and seniors have passes priced at a 20% discount from adult passes, and MDP pricing provides for a further discount. Cash and ticket fares are discounted about 33% from adult rates. A limited number of designated groups (the blind and war amputees) travel free. WheelTrans users are entitled to be accompanied by a Support Person at no extra charge. Children’s fares predate the TTC’s formation in 1921 and until recently floated between 1/3 and 1/2 of an adult fare. A “child” was defined by height with rings embossed on the stanchions at vehicle entrances to give operators an unambiguous measure. Older vehicles (PCCs and the Peter Witt) bear witness to how the standard was changed over years as the average height of children rose. Scholars’ fares date from the 1950s, and they lie partway between the fare for children and adults. Seniors’ fares came along by the 1970s in recognition of the then-new issue of a growing aged population and their relative poverty. The CPP was less than a decade old, and “house rich” oldsters benefiting from the real estate market were unknown. The Metropass dates from May 1980, and its cost has fluctuated between 52 and 47 “token” fares depending on the prevailing political and fiscal mood. Post-secondary student passes were added to the mix in 2010 after several years of lobbying by student groups. Free rides for children were granted in early 2015 as a political move by then-new Mayor Tory to “do something” quickly on the transit and poverty files. As part of their recent Operation Budget, TTC staff included a table showing the marginal revenue that they expected to gain if various discounts were dropped. Collectively the discounts against fully-priced passes represent $29.6 million of which 45% is due to the Post-Secondary discount. 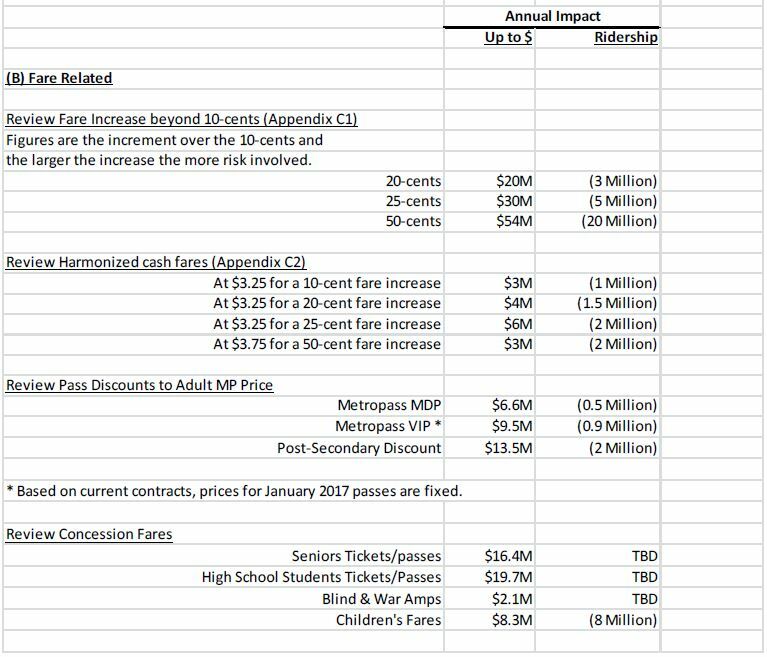 Concession fares for seniors, high school students and children have a total cost of $44.4 million. If all of these were eliminated, the $74 million in revenue would not offset the current shortfall, roughly $100 million, in the TTC’s operating budget let alone make any contribution to pending cost increases in 2018 and beyond. This table does not include any estimate for the complete elimination of passes or even “token” fares (in effect charging the same fare for all trips). Both of these would have a huge effect on TTC fares generally and would be a large de facto fare increase for the majority of TTC riders. Before any group of riders is treated as potential sources of added revenue, it is important to see the discounts in the wider context of a transit system’s purpose. Discounts for riders who make frequent use of the system, and especially those which cap their costs over a period of time, are important to building loyalty among riders and encouraging a view that transit is a “first choice” because it has no marginal cost. That outlook can be undone by unreliable service where the “cost” of taking transit includes substantial inconvenience and unpredictability. In effect, a trip may be “free” but convenience trumps cost. There is a social “good” in having more people take transit because this removes autos from roads, and allows the city to provide mobility on transit as an alternative to the need for car ownership. Getting more people on transit increases the political constituency for transit funding, and transit can grow based on delivering a good product at a cost riders perceive to be reasonable. Billions are invested in the infrastructure to move people around, and there is a broad agreement that this is good for the city’s economy and residents. All of them. A breakdown of TTC ridership is available on the City’s Open Data website, and the excerpt below shows recent years. 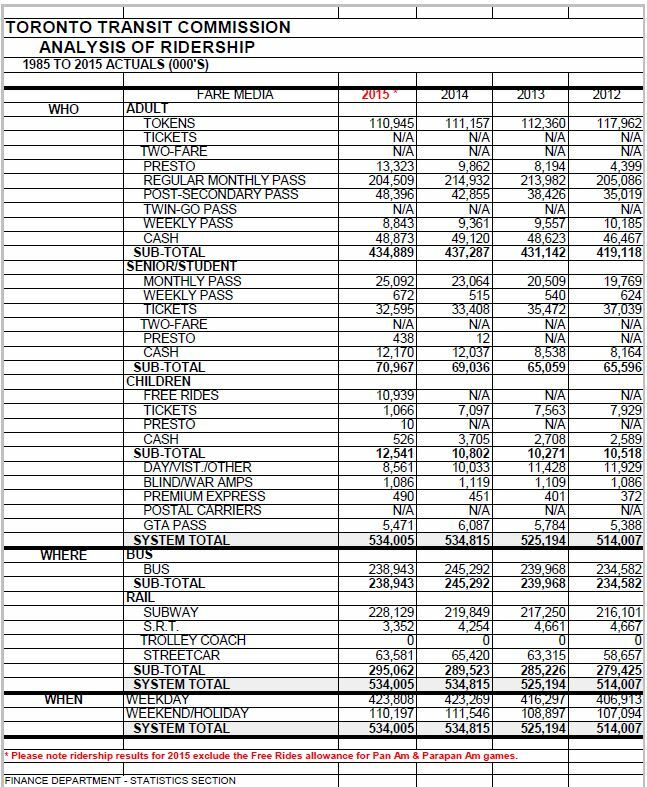 This table does not break down fare media into their discount groups such as MDP and VIP, but gives a sense of the relative importance of each type of fare and rider in the overall mix. Travel by some form of pass is the overwhelming majority for all trips, and even the relatively expensive senior/student pass attracts one third of its market. However, it is important to distinguish between rides and riders. Those who use passes take more trips than those paying by cash, tokens and tickets, and so the larger discounts go to frequent riders. 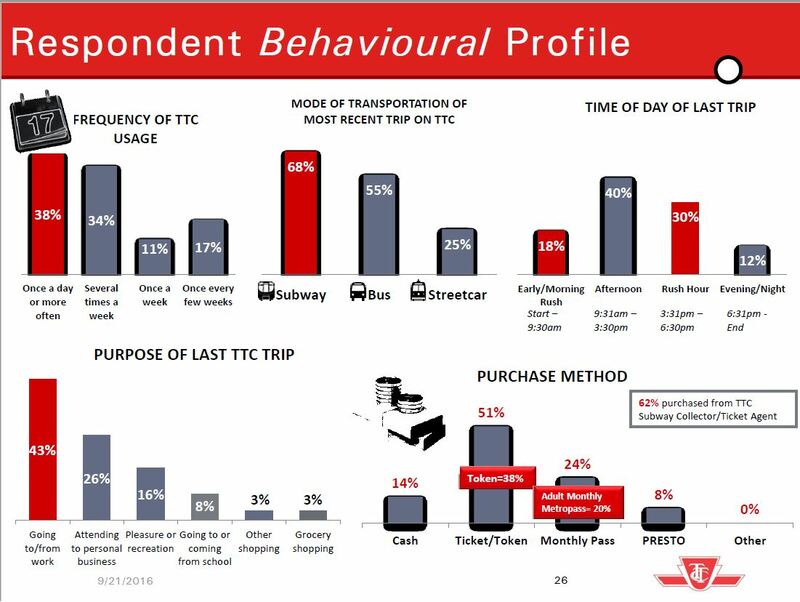 The chart below from the TTC’s most recent Customer Satisfaction Survey gives a very different picture of the mix in fare media used by riders. Only 38% of the survey respondents use the TTC once a day or more, and so it is no surprise that passes figure much lower among fare media than tokens, and that cash is relatively high. This reflects the profile of transit riders in the population overall, and begs the question of what would be needed to shift people into higher categories of transit use. Although the level of fares is typically the major part of budget debates including arguments for and against various types of discount, a great deal of transit policy affects costs by way of decisions on service. Riders on subway routes enjoy very frequent service (every 5 minutes or better) independent of the level of ridership. Subways have a high fixed cost from infrastructure operation and maintenance, as well as for the staffing of stations, but they have proportionately lower cost increases to operate more frequent service. Service is provided every 10 minutes on a core network of routes during all service hours, and at least every 30 minutes on the entire network with buses and streetcars running from 6:00 am to 1:00 am. All night service is provided every 30 minutes on the “Blue Night Network”. Some busy routes run more often at least for the “baby night” service if not the entire overnight period. Loading standards during off-peak periods are based on an average of a seated load on surface vehicles, although this is not always achieved. Fares cover about 70% of the operating cost of transit service, but make no contribution to capital costs including those for vehicles and infrastructure. Elimination of maximum headway constraints such as subway service frequency, the 10 minute network and the 30 minute maximum headway. Removal of service from routes, or sections of routes, during times when ridership does not exceed a target threshhold. Elimination of some or all of the Blue Night Network. Changes to crowding standards to serve existing demand with fewer vehicles. Most of these were costed as options in the operating budget report. The idea of shifting some capital costs to the operating budget has also come up on occasion, but the effect of even a modest change in this regard would have a large effect on fares because of the capital budget’s scale. All of the policies about planning and operating the transit network are just as much decisions about subsidies as are the questions of fare levels. Unlike fares, service and infrastructure decisions benefit or harm all riders. The only service that is specific to one rider group is WheelTrans, and it has legislated targets for service and eligibility. It is ironic that cutbacks to the “conventional” system could stymie efforts to shift WheelTrans users away from their dedicated services. At its December 1, 2016 meeting, Toronto’s Executive Committee endorsed the beginning of work toward reduced fares for the less well-to-do. The scheme would not come into effect until 2018 as it depends on Presto for implementation. Then it still has to make its way through the budget process and Council, but with Mayor Tory’s endorsement, this is fairly certain. The other key factor is that at least in its initial stages, the new discount would target only a small group of riders and therefore come at a low cost. Whether Council will simply add this on to the mounting TTC operating deficit, or actually come up with “new money” remains to be seen. City staff intend that it be at no net cost to the TTC, but nothing prevents Council from juggling the books simply by giving the TTC less subsidy than it might otherwise have received. The hard decisions will not come until the next term of Council for 2019 and beyond. The program is designed for implementation over three years with progressively greater eligibility. 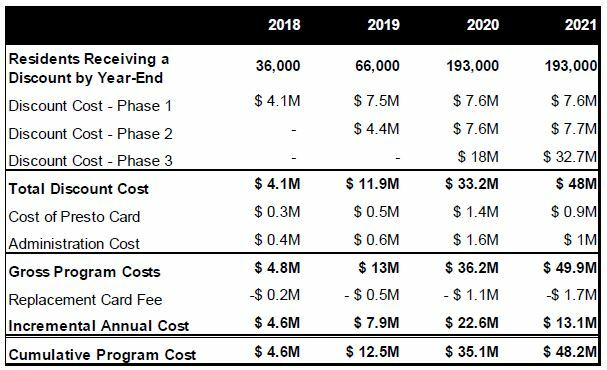 The cost builds in over time with the full effect in 2021 (year 4). The “Low Income Measure” varies depending on the size of the household from $22,537 for an individual up to $45,075 for a two adults and two children. This cutoff embraces 706,730 people in Toronto including seniors and children who already receive a transit discount. The proposed new fare would be at the same level as the current senior/student rates, in other words a 20% discount on pass pricing and a 33% discount on cash fares. The estimated population falling within the income cutoff who do not already receive a subsidy but who would be transit users is about 193,000, the number shown for the third phase of the program above. A separate Community Engagement Report looked at the profile of potential recipients of the new subsidy. Respondents were divided roughly equally between the city’s four quadrants, and over 80% of them used the TTC regularly with 43% using it daily. The source of the 193,000 figure is not immediately obvious, but the following table gives a good indication. Of the total target population of 482,550, a substantial number already receive a subsidy of some kind, either the free children’s fare, or the student fare which is equivalent to the proposed “fair pass”. The table above is dishonest in that achievement of the $100 cost per low-income resident occurs because everyone who is already getting a discount is included. The $48.2 million cost should be allocated against the 193,000 potential beneficiaries giving a cost of about $250 each. Similarly, the high cost/person for children, students and seniors is achieved by allocating the entire cost of each subsidy only against those in the target group. A “saving” would only occur if these subsidies were ended. This is the sort of analysis that suggests a different agenda was once on the table – eliminating discounts for all but the target low income-group – but that this was subsequently dropped. When a section is titled “Efficient Allocation of Funds” it is clear that reallocation of subsidies from some riders is the intent. The demographics of low-income Torontonians implied by the table above are quite interesting. Under 40,000 seniors would even qualify for the Fair Pass program, less than 2% of the city’s population. Children and students outnumber the seniors by over 4:1. The largest group contains roughly 280,000 who do not fall into an already-subsidized category. Advocates for low-income fare subsidies argue that even at a 20% discount, the Fair Pass will not be affordable to many in the target group, although the 33% single fare discount would be the more likely to be widely used. The report misses a few key implementation points that are snarled up in TTC policy decisions. First is the question of a timed transfer. If the TTC made one fare valid for two hours without its byzantine transfer rules, all riders including those on low income would save money by avoiding charges for “trip chaining”, grouping several short hops together in one outing. Second is the matter of fare capping. If the “fair pass” were implemented as a monthly cap equal to the cost of a pass ($112), then riders would not face the need to pay out in a lump sum at the start of the month. Both of these options are easily within Presto capabilities because they are provided to other GTA transit operators. The central problem of all fare debates is that none of the potential funding governments wants to shell out more money, but the politicians want the photo ops, the air time that bragging about some new benefit will bring. At Queen’s Park, we have Metrolinx conducting a “fare integration” study doomed to failure by treating the problem as a zero-sum game where any fare reduction and lost revenue in one part of the network must be balanced by gains elsewhere (with the added caveat that Metrolinx won’t give up a penny). 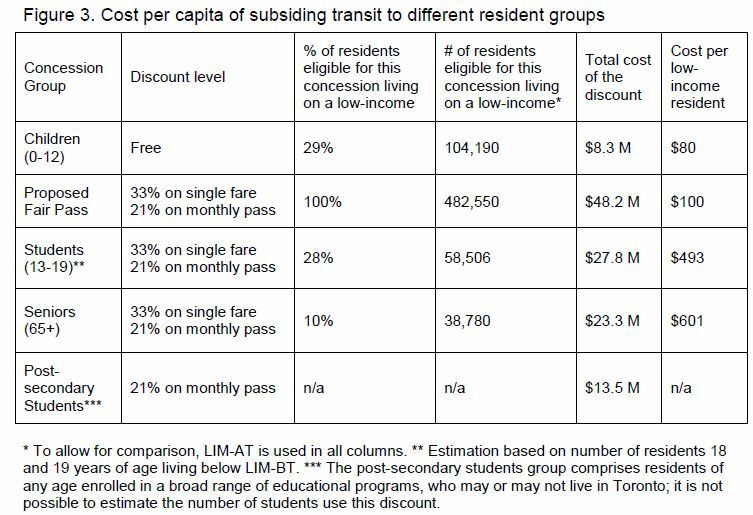 In Toronto, the idea of looting the existing concession fares has surfaced regularly, and we hear constantly about how affluent seniors are unjustly receiving civic benefits, not to mention the subsidies given to children of the “middle class”. Ironically, at the same Executive Meeting, Deputy Mayor Minnan-Wong moved, and the committee endorsed, that any tolls implemented on Toronto’s expressways be capped so that seniors would not pay more than a fixed amount. I suspect that seniors who drive frequently on the expressways are unlikely to be among the target population for lower transit fares. In this debate, nobody appears to be taking the part of ordinary transit users who could face service cuts to pay for increased fare subsidies. There is an assumption about the affluence and ability to pay by those who do not fall under the low income threshold that would be laughed out of Council if the subject were property taxes. Collectively, Toronto is a rich city and more revenue must come from its residents and businesses to pay for everything we would like to have. Despite the prosperity, Toronto also has a growing poverty problem affecting many city services including transit and housing, and there is little money on the table to pay for a growing and expensive list of civic baubles. If Council simply shuffles responsibility for the Fair Pass subsidy onto the TTC and hence to the riders and the service plans, that is no leadership at all. If there is to be a debate about targeted subsidies, then Toronto should have that debate, and be prepared to face those who now have lower fares but would no longer qualify. Cutting existing discounts may be a quick fix for one year’s budget problems, but it will not address the full need for transit dollars. Such a policy, coupled with the inevitable service cuts, would signal a transit system in decline. Why have multi-billion dollar transit plans but drive away riders? Mike Filey passed along a cutting from The Star about the decision to implement Seniors’ fares effective January 1, 1971. When they came into effect, Metro Toronto paid the TTC a special subsidy of $1.363 million per year to cover the cost, and although there were still two fare zones within Metro, a senior could make a cross-border trip for one half-price senior’s ticket. Until 1971, a smaller group of 60,000 people were eligible for half fares because they were over 70 and receiving the Guaranteed Income Supplement (GIS), or between 65 and 70 and qualified for free hospital and medical premiums based on low income. Executive Committee had recommended that the lower cost fare be extended to all people without a means test who were 70 or older, but Council extended this to all over 65s. Thus were the current seniors’ fares born. North York Controller Paul Godfrey said the moves are steps toward the day when no one will pay fares and public transit will be paid for by tax revenues. This entry was posted in Fares & Fare Collection, Finance, Transit. Bookmark the permalink. Is it possible to ascertain what the fare would be, if all concessions, of all kinds were eliminated, and we had a single fare? (all riders pay the same, with a possible 2 and under free or such). Continuing the assumption of a single-fare, 10-fare and pass purchase model? Steve: This would be possible but tricky as the change in the fare levels would be well outside of the range where there is any experience with elasticity. It is important to note that of the total revenue, that “lost” to concessions is a fairly small part of the total. If everything were equalized, the drop in the standard adult fare would probably not generate much new ridership while some existing discount trips would be lost. If your goal is to maximize revenue, this may be acceptable, but then we should stop talking about how transit can be used to get people off of the roads. Incentives cost money. I noted after recent reports/discussions here, and elsewhere, that the TTC fare has risen far faster than inflation, from $1 per token (on a purchase of 10), in 1990 to $3 effective 2017. While the Bank of Canada reports inflation over the same period was 62%. It occured to me, that this means the cost of a token today, had it risen by inflation, would be $1.62 or $16.20 for 10. That is below the currently proposed low-income fare, as well as less than current senior/student pricing. It makes me think that lower prices and fewer concessions would produce the same result of helping low-income earners, and be simpler to manage. Scholars tickets used to be good only Monday to Friday, up to 5 PM only, and only on school days. They were no good during July and August or weekends or holidays. However, drivers would accept two scholar tickets in payment during the off hours. A pattern seems to be developing here. Give an increasing number of people cheaper access to the system, increase the fare for all others, and reduce the subsidy. Eventually this will result in gutting the TTC (and possibly the city core also as some US cities have seen). There is a city in Ontario that has taken another solution to public transit subsidies. It has said NO to public transit in the first place. They want only people wealthy enough to own their own home and provide their own transportation (2 and 3 cars) to live there. It was not too long ago when the 9 Bellamy had hourly service and only 1 bus on the route over the weekends. It shut down at 10 pm and for the most part the route was avoided during the weekends. Here’s to hoping they don’t abandon maximum headways. Here’s my target group: Car drivers who currently pay precisely zero in municipal taxes/tolls in spite of being the beneficiary of huge city spending. This will partially change if there is tolling on the Gardiner/DVP, but I note that the price tag of the Gardiner Boondoggle just jumped another billion dollars from $2.6 billion to $3.6 billion. My solution: Put car drivers on an equal footing. Put in a toll for car drivers not just on the Gardiner/DVP, but every street in Toronto. Set that toll equal to the current TTC cash fare. This will have three beneficial effects. First, it will raise money that we badly need. Second, car drivers will be affected by TTC fare increases. Thirdly, it will discourage car driving. Right now, car drivers currently poison and kill 280 people in Toronto each year with their lethal cancer-causing fine particles and other poisons. These poisoning victims are disproportionately innocent children and the elderly. Every car trip that we can deter with a toll could be the car trip that put out the fine particle that caused an innocent child to die a horrible, painful and lingering death from cancer. The “children ride free” was a poorly thought out ploy to garner votes on the part of the mayor. First phase: One adult = 1 child free. Additional children one dollar. During non rush hours. Next phase: Extend to all hours. Next phase: Extend to additional children free, stiil only when accompanied by at least one adult. Next phase. Children free unaccompanied but with proper photo i.d. to prove age eligibility. Paul Godfrey and current local attitudes to taxation aside; what are your views on free TTC for all? Steve: I believe this is one of those political ploys like “tax freezes” that does not address the basic problem of transit funding. Elimination of fares would require that about $1.2 billion in new revenue would have to be found. That is on the order of a 30% property tax increase, or a large jump in some other funding source. Almost certainly service would not be improved because the imperative would be to keep costs down no matter what, and we would have a worse transit system than before. wklis said: Scholars tickets used to be good only Monday to Friday, up to 5 PM only, and only on school days. This comment tweaked an idea. With the new payment system we may be able price according to time of day. Obviously the most expensive fare is rush hour but fares would be 15% cheaper in off hours. Maybe 15% isn’t enough but the idea is to offer a “cheap” fare to encourage more people to think of using the TTC to get around. They get used to it and accept using the TTC for rush hour. Also, some on flex-time may shift out of rush hour which reduces the capacity requirements – hurts operating budget but holds capital building costs. We may be able to easily separate seniors and scholars. Seniors would pay full fare during rush hour and only get a discount in off hours. I would suggest that scholars pay full fare after 5pm, even if it is because they are going to work. I also understand that schools may decide to start later because of the sleeping habits of “scholars” these days which may lighten the rush hour capacity requirements. Would it be possible to issue a tax on parking fees? The tax would go directly to the TTC. A few years ago, I thought I heard Toronto’s parking fees were low, compared to other cites. Just looking for more money for the TTC. Steve: There is a big problem with the presumption that all riders of a certain type should only travel during certain hours, and that they can adjust their lives accordingly. As for a parking sales tax, this is among the many revenue options that have been presented in reports from city staff, but it is not supported by Mayor Tory. Transit is just a service to move people from A to B. It should not be used as a social policy tool. Does allowing low income people on the 407 with a lower toll rate alleviate poverty? The answer is no. We should not add complexity to the billing system. Whether it is Presto, SUICA or Oyster, they are not programmed to have many fare class. Look at Bell Mobility. Everyone talks on their HSDPA or LTE network, but there are thousands of plans. Uber driver gets a 30% on an in market plan while City of Toronto workers gets a special EPP plan. This is why cellphone service has so much complaints. When there are thousands of price plans for the same thing, billing errors happen. People also try to cheat the system by placing themselves on those cheaper plans. For example, how could an immigrant who do not speak any English be on a Sunnybook Hospital plan? Last time I checked, the hospital requires English speaking skills. The only goal the TTC should do is to run a world class transit system using a combination of fares, business income and government subsidies. With a good transit system, low income people will get by without buying a car to get to work and carry on with their lives. Who preys on the poor? The Buy Here Pay Here lot and subprime auto loans. This is exploitation. No matter how expensive the TTC cash fare, it is still cheaper than 29% per annum interest rate auto loans. People will always complain things are too expensive. Whether it is broadband internet, electricity, bread or mobile data, it is human nature to want a cheaper price. Whether it is a basic human right is up to society at large. If Canadians want transit to be a basic right like health care, then pay up. We cannot have Swedish style government services with US levels of taxation. We are not Saudi Arabia where the state owned oil company can pay dividends to general coffer. Steve, W. K. Lis’ comment was partially right. The scholars tickets were good from 6AM until 4:30PM daily. I remember that very well. Had a football practice after school in 1970 or 1971. At the end of practice, I only had a few minutes to make the streetcar. Changed ran out to the car stop at Bathurst and St. Clair and waited a few minutes for the Rogers Road car. Time…4:32PM. I only had one ticket. Put it in. Driver then told me I needed another or the money or I would have to get off. I had to swallow my pride and go around begging on a crowded streetcar. Got the fare. Nice lady . Never forgot it. The other problem with these tickets was that you could only purchase them at the subway station kiosks or the bus garages and streetcar barns. I was one of many who walked to Wychwood to get tickets before going on the vehicle. Yes, the real issues with the fares is how the clogging car gets the relatively free ride, and how the carservatives of the suburbs that dominate the City will not begin to impose more direct user pay on the mobile furnaces, though they are costly to be running. (Car subsidies tend to be hidden in various budgets, including health care, and aren’t an easily found item, if we even could get around to looking at them honestly). Having user pay for the vehicles at the same rate as the transit system would do a great thing for our budgets, and might allow us to be far more generous in Suspect Subway Extensions (as one example). As a further proof of how carrupted we really are (a common issue throughout North Americar if not the world), is how, after only a couple of curtailed deputations, it took Exec Cttee maybe three minutes to OK project creep of an entire billion dollars for the Gardiner, and still no look at transit options and no EA either. While Mr. Tory might be seen as a leader to get us back towards tolling discussions, the main thing is that it is punted up to the provincial level to create issues for the Liberals in some of their power base, while avoiding any real chance of user pay on the Gardiner etc. within this election cycle (It needs to be studied, despite having c 6 years of road tolling conferences right at the City Hall doorstep). I borrow my child’s PRESTO to travel for free. Steve: Would it be too much for me to point out that “free ride” Presto cards for children do not exist yet? You are blowing hot air. If you had the presence of mind to say “I will borrow”, then at least we could have a debate about checking cards. Benny Cheung writes: SUICA [is] not programmed to have many fare class. Not strictly true. I’ve been on the JR. You can use your suica to buy first class tickets (green car). It works through a system of surcharges. There are fare gates which allow you into the station and on regular cars then there is another, standalone machine inside the station which allows you to upgrade your “ticket”. In the case of suica, you just upgrade your payment. The fare gates collect the base fare and the upgrader collects a surcharge. This same setup exists for the many surcharges which exist for express trains, bullet trains and on other railways. Suica is accepted everywhere on any vehicle from any company. It is even accepted in stores! IC card payments work really well for the JR because of the complexity of the fare system: fare by distance and by mode. Fumbling for change while you try to buy the right value ticket is a legitimate concern. Then going to a separate gate to get a transfer… You get the idea. Something like presto provides no real advantage to TTC users because the fare scheme is dead simple. Implementing it with a not-so ulterior motive to introduce a more expensive fare scheme is a corrupt bargain and I’m surprised few see it as such. You can bet there will be more clamors for concession fares when long trips begin to climb in price. SUICA is only accepted on the Green Car on the Tokaido Main Line, Yokosuka Line, Shonan Shinjuku Line and mainly lines around Tokyo. Basically, Green Car seats without seat reservations. The Tokaido Shinkasen is strictly a ticket based system. Depending on how you buy the ticket, the ticket may comes in three part. The first one is the standard fare based on distance. The next one is the express surcharge. The final piece is the reserved seat, Green seat surcharge. Even the Buy On Board is cash only. The strange part is that on a Limited Express train, they will accept SUICA for payment. On the Tohoku, Hokkaido, Akita and Hokuriku lines, only the registered SUICA cards can be used. Those must be set up with a preferred route. The other limitation is that it only applies to the non reserved seating. The limitation of SUICA is very apparent. At certain stations west of Shizuoka Prefecture, this is the boundary between JR East and Tokai. The local trains will run between those areas. However, one cannot begin a trip in JR East and end at JR Tokai. SUICA will not be able to calculate the fare and thus a paper ticket is required. James said: I noted after recent reports/discussions here, and elsewhere, that the TTC fare has risen far faster than inflation, from $1 per token (on a purchase of 10), in 1990 to $3 effective 2017. Generally, people conflate the “Consumer Price Index” with “inflation”. However, there are many types of inflation, such as construction inflation or wage inflation or house price inflation. For example, “average” Canadian wage was $13.73 in 1991 and $24.12 in 2016, which is an increase of 75.6%. The average sale price of a Toronto house in 1990 was $255,020 but $725,857 in 2016, an increase of 185%. If property taxes were set as a fixed rate for the value of the market rather than the rate being continually lowered to keep the tax take relatively constant, then we’d have money to subsidy the TTC and other services. James said: It makes me think that lower prices and fewer concessions would produce the same result of helping low-income earners, and be simpler to manage. Kevin Love said: These poisoning victims are disproportionately innocent children and the elderly. Do guilty children have some sort of innate protection against pollution? Steve: More to the point, all who are poisoned by pollution are innocent except to the extent that they might be contributing to the problem, although options to avoid this are not always available. Kevin Love said: Thirdly, it will discourage car driving. The problem is that car-drivers are a larger political constituency. Mayor Tory won’t bring back the Vehicle Registry tax which was $720/year, but he’s considering tolls that’d cost $1,040/year for two-way daily use? The only way I can see selling tolls/vehicle taxes in Toronto is by making it disproportionately on those that live outside of Toronto in the London Congestion Charge style. Steve: You have an extra zero in the VRT value there. Harrison said: what are your views on free TTC for all? Who’s interested in a mobile homeless shelter program? Benny Cheung said: Does allowing low income people on the 407 with a lower toll rate alleviate poverty? The answer is no. I might make the argument against that. If a marginal employed family could earn higher wages in a location further from home while still complying with the typical 10 hour subsidized childcare day, and the traffic delay between the 401 and 407 were the difference, then subsidized fares could raise them higher while increasing the available “family time” instead of being as stuck in traffic or working longer hours in a lower paying, more accessible job. Benny Cheung said: Whether it is Presto, SUICA or Oyster, they are not programmed to have many fare class. Presto has at least a hundred different fare classes across the GTA. You have capped fares, weekly fares, monthly fares, children, students, seniors, super seniors, uni students, loyalty steps, co-fares, etc. Benny Cheung said: For example, how could an immigrant who do not speak any English be on a Sunnybook Hospital plan? Sunnybrook passes are also available to volunteers, and Metropasses are shareable so long as two people aren’t trying to use it at the same time. Benny Cheung said: We are not Saudi Arabia where the state owned oil company can pay dividends to general coffer. Norway is my preferred government funding model. Bill R said: With the new payment system we may be able price according to time of day. How about “reverse surge pricing”? Cash and tokens have a fixed price and value of “one fare”, but using Presto you get a discount based on the maximum network load on your trip? This would give people with more time flexibility the option to save some money by taking an alternative lighter travelled route and spread demand over a larger part of the network whether temporally or spatially. I agree that eliminating the fare subsidies for specific groups of riders is not a desired or strategically effective way of tackling the budget issues. 1) Charge $2 for parking in the TTC lots on weekends, instead of providing free parking. That change would be relatively harmless, and could generate about $2 million a year in extra revenue (assuming 10,000 cars on all TTC parking lots combined, times $2, times 100 weekend days per year). 2) Move towards charging slightly higher fares during the peak hours vs off-peak. Mapleson touched on that option in the post above, proposing a “discount based on the maximum network load”. The peak fare could be, say, 15% higher than the off-peak fare, and apply to all categories of riders. I assume that electronic / Presto type fare collection is needed to make it practical, thus the Presto roll-out has to be completed first. This change will not be totally harmless; some riders will complain that their job / study / medical needs force them to travel during the peak hours and pay higher fare. However, riders who do have some flexibility will switch to off-peak travel, and that should slightly reduce the fleet requirements while improving the riders’ comfort. I hope you’re not suggesting that peak hour fares should be EVEN more expensive than they are now (with the new fare increase that is proposed included)? One could give a 15% discount in the off-peak periods, and explain this as a way of encouraging people who can travel off-peak (i.e. those who have the possibility to have flexible work schedules, or whatever) to do so, and thus reduce crowding in the peak periods (and save on the costs associated with that, whether future or present). Also, I presume it would drive ridership a bit which would compensate for the lost revenue. Actually Steve, they do exist, despite what Andy Byford and Brad Ross have been saying. If you go to any other Presto-enabled transit provider such as GO, you can get a card with a child concession. As far as I can tell, Presto concessions are universal so once a card is set up for a child it will work across all transit authorities. I purchased a child-concession Presto for my daughter while we lived in Brampton during the initial roll-out. She has since used it on MiWay, YRT, GO and yes, TTC. She’s now 13 so we’ve just moved her up to a student concession and it seems to be working across all providers as well. Steve: Thanks for this info. That is a very simple way of looking at the world. Are you arguing for eliminating all discount concessions? I agree that the TTC’s job is to run the best Transit System they can. That’s actually what their charter says and what they do. The social policy aspects are mandated by the city and really have very little to do with the TTC. That aside, I don’t think you understand what is meant by low income. Ontario Works for a single person pays out less than ~$680. Total. Can you live on that? A metro pass is nearly a quarter of that. These are not people for which buying a car is an option. Mostly these are folks who have have found themselves in an unfortunate circumstance and just want to get back to work. Affordable rental units ($600 and below) in Toronto are disproportionately skewed toward the edges of the city and jobs are not necessarily where the affordable housing is. Low-income people often have to make hard choices but forcing people to chose between food, rent or transit is not only inhumane, the economics don’t work. First, if you’re doing a bit better and just struggling to pay for transit you’re far more likely to “stretch” a transfer. That’s already costing the TTC income. But when it simply gets to the point where you can’t afford to commute daily, you generally loose your job. When you take away the ability for low-income people to work, you force them on to social assistance like Ontario Works which costs all of us far more than simply making transit affordable. I speak from first hard experience here. I’ve been in a bad situation, but caught a couple lucky breaks and things are improving, but without that luck I’d be in a much worse place right now. We should not add complexity to the billing system. Whether it is Presto, SUICA or Oyster, they are not programmed to have many fare class. Look at Bell Mobility. Everyone talks on their HSDPA or LTE network, but there are thousands of plans. Uber driver gets a 30% on an in market plan while City of Toronto workers gets a special EPP plan. This is why cellphone service has so much complaints. When there are thousands of price plans for the same thing, billing errors happen. People also try to cheat the system by placing themselves on those cheaper plans. For example, how could an immigrant who do not speak any English be on a Sunnybrook Hospital plan? Last time I checked, the hospital requires English speaking skills. Again, off-topic rant I’ll ignore. Toll every road? Dear Lord the City is in a transition period and you choose to be angry at those people from outside the core that use(d) an infrastructure that help make this City great over the years and have little other choice when compared to the rich options you are surrounded with for such great economic value. Is it time to transition into a new era? Yes. But you should have a plan built for these people before you cut them off. Truly a heartless, narrow minded approach. You also advocate a system that allows the wealthy to use our highways and our poor living in the most transit neglected areas to face another hurdle to access quality jobs in the core. That car commute may now become unaffordable. But who cares right? It’s all about your special place in the core. Car drivers are taxed heavily thru the Provincial fuel tax and unlike TTC riders in the core they pay an unsubsidized cost for their vehicle’s maintenance. For many of these people there is little option but to drive given the current state of existing infrastructure outside the blessed area of the City. We are a City in transition and we all need to pay for both growth and expansion everywhere to even consider the anti car dream. Property taxes where we all share the burden is the most reasonable way to tax. It’s not even a reality to consider cutting off the car into the City until we have actually full built a network for those within the City to move around. We hardly have a solid plan at the moment. On a more positive note…. We’re on the cutting edge of fuel cell vehicles and although it should have been happening sooner it will certainly take care of you car sickness concerns long before the you dream of car extinction ever occurs. Here’s my target group: Car drivers who currently pay precisely zero in municipal taxes/tolls in spite of being the beneficiary of huge city spending. Joe M said: You choose to be angry at those people from outside the core that use(d) an infrastructure that help make this City great over the years and have little other choice when compared to the rich options you are surrounded with for such great economic value. Actually, it’s the crux of the problem, not the inner suburbs that are part of the City, but the outer suburbs that are not. There are over 300K non-residents vehicles that come into Toronto on a daily basis (from TTS 2011). They benefit from our taxes. By tolling every road at the City limits this would raise $500M of Tory’s $2B for tolling the DVP/Gardiner, but without Scarborough residents paying a penny. $0.147/L and 7% PST aren’t “heavily taxed”. Newfoundland has a $0.33/L excise tax, BC has $0.2117/L, Quebec has $0.202/L. We’re $0.002/L above the Canadian average and we pay just $0.0375/L in taxes more than Alberta. Joe M: Car drivers are taxed heavily thru the Provincial fuel tax and unlike TTC riders in the core they pay an unsubsidized cost for their vehicle’s maintenance. Then why does so much of the money I pay in property taxes go to Transportation Services to maintain roads used and worn out mainly by car drivers? TTC fares pay almost 3/4 of the operating costs of the transit network. I don’t have recent figures at hand, but I doubt motorists even come close to paying that fraction of their direct costs.